Elections and voting are a hallmark of a successful democracy. During election season it is essential that American citizens go to the polls and vote to help ensure a successful and well-functioning democratic process. Before and after the election results, tensions and emotions run high. Emotions run high for each side of the political aisle. Those whose candidates have scored major victories are hopeful while those who had great loses are perhaps discouraged and try to regroup. After elections have come and gone it is often good to remind ourselves that the United States has a system of checks and balances. These checks and balances are in place to ensure that one person or group of people does not have too much power. This phenomenon is known as a separation of power. People turn out in larger numbers for the presidential election because the president is the public face of the government. Most Americans see the power concentrated in that office. Often when individuals are not happy with the way things are going in the government they blame the president. But people lose sight of the fact that the United States government is made up of three branches of government: the judicial, legislative and executive branches. Americans must understand that only one of the branches consist of the president (The executive). The judicial branch consists of the Supreme Court and the legislative makes up congress (Senate and the House of Representatives). The social studies classroom is the optimal place to teach about the structure of the US government. A major function of social studies is to help students understand the nature of the American democracy and the key role they can play in the country’s success.This helps students know the rights that they have. 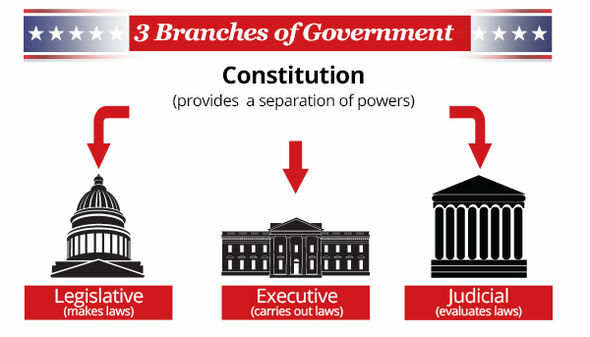 Below is a sample lesson that can help teachers address the topic of the three branches of government in the US and help students clearly understand the role and function of each of them. Objective: Students will understand and be able to simulate the function of each of the three branches of government. American Government Theme: Students examine the Founding Documents which form the basis for the United States of America and how the American people govern themselves at national, state and local levels of government is the basis for this course. Students may also impact issues addressed by governments through service learning and senior projects. ROLES AND SYSTEMS OF GOVERNMENT Content Statements: 22. The U.S. Constitution established a federal republic, providing a framework for a national government with elected representatives, separation of powers, and checks and balances. 23. The U.S. Constitution protects citizens’ rights by limiting the powers of government. The class will be divided into three groups that represent each branch of government; the executive, legislative and judicial branches. Each student will be assigned a role within their assigned branch. For example, within the executive branch students can be assigned the roles of president, vice president, secretary of state, secretary of education, and so on. The largest group of students will make up the legislative branch, which is congress. This group will be broken into two subgroups, the House and the Senate. Within congress students can take on various roles such as congressmen and women from various states and districts. For example one student might play the role of the House majority whip. The students that make up the Judicial branch can consist of the nine Supreme Court justices and various other federal courts, depending on the number of students in the class. After students thoroughly learn the function of the branch they represent, the classroom can go through the process of introducing, passing or challenging a law. For example, the house can introduce a bill in the classroom that is ultimately vetoed by the president. In another simulation a new law can be challenged in the Supreme Court, thus setting a new precedent. Each group can also simulate their branch on separate days. A slight variation of this activity is for the instructor to allow students to create classroom rules (laws) that can be accepted by the House and the Senate and be supported or vetoed by the president. For a summative assessment students can pretend they are government officials tasked at creating a drop description that accurately discusses a specific role in the government and the function of the branch they are a part of. Students should write about the role they played in the simulation. What are the Midterm Elections All About? This topic that is covered is a very important aspect of the United States. Being a citizen you are have the choice to vote for who you think is right for the country. I feel as people don’t take enough advantage of this. As much as they have a choice i agree that if it isn’t the person they think it is, then they blame the president for everything. I feel as everyone should read this to let them know about what really happens. That there is more than just the president. There is a connection to something we have talked about in class that this is a time that everyone get a chance to do something and be equal. It shows we are one in the world. As well as it shows when people don’t like something from someone they start name calling towards someone, which would be the president in this aspect. This is something we have learned though this class not to do, and look more into it and be educated. I really like the teacher resource part. (Don’t know if it is because I want to be a teacher or what but its good). The way you set up the three different branches in a classroom, the students could study it and form a debate from this. They also could read articles and write a paper on what they think about the article. Lessons could be formed from this in many ways. I think this topic is great in that it shows the importance of elections and participation in elections. This is often times something that can be taught through a biased lens and can be complicated. However, it is crucial for students to know and understand the importance of elections and their function in the American government. This connects to several things that we have discussed in class, specifically giving each student their voice and respecting it. This could relate to the fishbowl activity that we did directly with a controversial topic. The teacher resources that are available in this article are fantastic. They provide great guidelines that each teacher can use and make their own to fit the needs of their specific classroom. 1. Often overlooked in politics is the amount of authority and responsibility given to the members of our Legislative branch – Congress which creates the very policies/laws that effect our every day life and the Judicial branch- the Supreme Court that rules which of those laws are constitutional and repel those that infringe on the rights of American citizens. This topic is very relevant considering the amount of added media attention placed on the congressional hearings to decide the Supreme Court appointment of Brett Kavanaugh. 2. This topic reminded me of the former President Barack Obama’s book Of Thee I Sing. President Obama explains to his young daughters about the endless accomplishments of people of all types of races, creeds, and backgrounds that shaped our country. Many young boys and girls aspire to be the President someday and help lead our nation. However, it is crucial to remember for every strong President in our history we have needed strong Congressmen/women and Justices that have shaped our future too. 3. The lesson plan you provided is a wonderful tool. I remember competing in a mock election in a social studies class. Each person had a specific role in the election such as voter, Presidential candidate, VP candidate, Campaign manager, press secretary, etc. This is one of the lessons that inspired me to learn as much as I could about politics in hopes of one day running for office. I believe this lesson plan would have an even stronger impact on the students. The act of role playing provides them with a great opportunity to see the need we have for judges, lawyers, lawmakers, etc. 1. This was an excellent article that really highlights the important of voting. The part that discussed the common trait of American voters only turning out in high numbers for presidential elections rings very true. More Americans need to be aware just how important it is to vote in elections that involve legislators and other offices, not just the president. 2. One of the topics we discussed in class was that of civic education in the classroom. This article reflects the importance of civic education in the classroom, as those students will graduate and become voters. 3. I really enjoyed the idea of dividing the classroom into the three separate branches of government. It would give the students a chance to learn how the three branches of government work and work together, and could equally serve as a good opportunity to foster debate and build teamwork in the classroom. This article really shows the importance of voting. It is crucial for people to know the importance of voting and need to get their voices heard! Every vote counts and needs to be respected. I’m glad that there are checks and balances, it ensures that one person or group do not have more power than the other. Checks and balances are vital to the American government. Without it, one group of people would have all the power. And when people have too much power, it is not uncommon for them to make outlandish changes in the government and society. It also shows how necessary it is for people to make an informed vote. It is not enough to just go out and vote because it is your right. You must know how your vote will impact society in order to make America as great as it can be. This article was really interesting to read, because as someone who voted for the first time in November 2018, it’s crucial to know the balance of power within the government. A lot of the time people don’t vote in midterm elections because they don’t think the more localized positions hold as much importance as the President and Vice President do. Every single person who is elected plays a large and collective role in the government, so it’s necessary to take part in every election by researching the stances of each candidate and voting for those who will have the best impact on our communities. This was a great article and I love that you brought up the fact that if people do not like something that is going on in the country, they blame the President. People often forget that the President does not have all of the power, he, and possible she one day, is just a face for our country. It is also important to not just vote for the President, but to exercise your voting rights for everything! Vote for your mayor, vote for your elected officials of your county……. anything you can vote on, do it! Checks and Balances are so important for the Government. These ensure that all Branches stay equally powerful. When elections come around, it is essential that every citizen goes to the polls and votes. This will help make sure that everything in the election is fair and runs smoothly. Every vote counts. I vote in every election after studying up a little bit. This a very good read. This article showed the importance of elections and voting. Every person has a right to vote and to voice their own opinion. Some people in our world take advantage of voting during an election. Also these teacher resources are very beneficial. The article overall was well planned and well thought out. Some of the ideas you brought to the audiences attention was something we all forget, “if people do not like something that is on in the country, they blame the President.” While this statement might be true, I do not agree with how today’s President is viewing and portraying certain races/ethnicities. Then again I often find myself feeding into the media’s portrait they have painted him to be as well. This article reminds me of the current government shutdown due to certain branches/parties unwilling to succumb to the President’s wants and/or needs. I absolutely loved the lesson plan, however, and wish to help my students understand the outside world as well and that all elections are important, big or small. Overall the idea of checks and balances is good in our country. Without this I believe the process would not be as informative or trust worthy without all opinions. All of those in the government play a collective role and without certain people, those roles could not be filled. I think it is great to ensure students understand how checks and balances work. Without this many future citizens may get the wrong impression on how the U.S. operates. One of these wrong impressions I feel is being played out, especially today are the responsibilities and effects of the presidency. Awesome article that goes much more in depth on the fundamentals we learned in K-12. I really love the role-play lesson activity. I want to teach upper elementary and having them enact ‘class laws’ in that way could be so much fun! This article was an awesome read for me! Honestly, I did not really understand the full importance of voting, so this article really helped. I think this could potentially be a lot of citizen’s problems and I hope to educate others and help spread the significance of elections and voting. I really like how this article explains what the three branches of government are. A lot of people tend to blame the president when it comes to politics. This is not true as there is two other branches of government that also has control. I was also nice to read about how voting works. I did not know exactly what all went into that, and how the groups were made. I learned something from this article! I just taught my students a lesson on the three branches of government. This lesson was extremely important to them, because in two weeks they are taking to staple 4th grade field trip to the state capitol in Frankfort, Kentucky. Having the students understand the voting and election process, as well as the three branches of government and how they all operate together is very important. They thought that the idea of checks and balances was really smart, and they thought it was interesting that the framers of our government thought that people would use too much power if they had the chance to get ahold of it. This article is a really great summary of how the election and voting process works, along with the branches of government. I really appreciate that you do bring in the perspective of “people try to point the finger at one person, but need to understand all of the different branches of government”. Great article! This a very good read. This article showed the importance of elections and voting. Every person has a right to vote and to voice their own opinion. Some people in our world take advantage of voting during an election. I can see why these teacher resources are very beneficial to not only them, but to their students as well. I think the article did a great job explaining the three branches of government and what each branch represents. It can be confusing for some students when learning about this topic so I liked the resources provided that could be available if they needed extra assistance.